Combine the gula melaka, caster sugar, water, salt and pandan leaves in a pot. Cook over a medium flame until dissolved. Strain the syrup and return it to the pot. Add in the grated coconut and continue to cook for a few minutes until sticky. Leave to cool. Sieve the flour into a mixing bowl. Make a well in the center and crack in the egg. Slowly stir in the salted coconut milk and 3 tablespoons pandan juice (or pandan extract) with a whisk. Mix until there are no lumps. Set aside. Check the consistency as you add the water. It should be quite watery and swirls easily when put onto the hot crepe pan. Heat up a crepe pan over a low flame and grease lightly with oil (or oil spray). Pour 2 tablespoons of the batter in the center and swirl the pan to coat it form a thin crepe. Turn once and cook the other side. The first side cooked is the display side. Mastering the crepe takes practice, as it will break if the consistency is not right. Transfer cooked crepe to a chopping board. 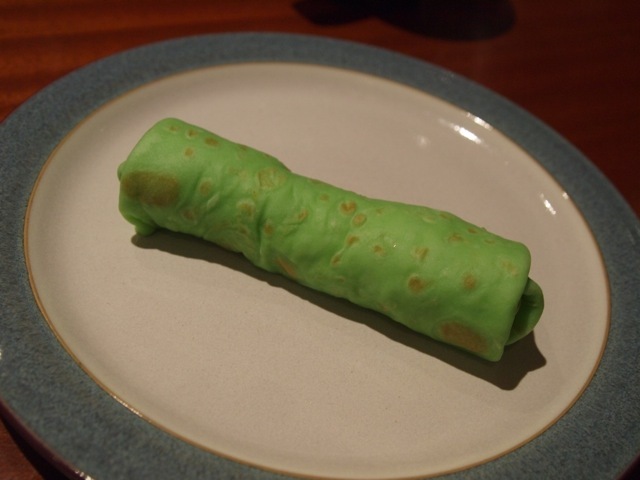 Place 2 teaspoons of filling on the crepe and roll it up like a spring roll. Must try this, Chin. I'll probably have to get the pandan leaves from London. Li, can you get fresh or frozen grated/shredded coconut in London? Dessicated doesn't work, and also some of the frozen grated coconut can be quite coarse, so you'll need to try a few brands.